Pew Internet & American Life Project has just published a new research study on Social Media and Young Adults, which — despite its title — has insights to offer about all age groups of American users of the Internet. There are a number of statistics here that will be of interest to nonprofits wanting to connect with or recruit members and donors online. For example, the study shows, among other insights, an increase in the numbers of both teen and adult Americans who spend time on social networks, and that Facebook still dominates across all age groups. 93% of teens ages 12-17 go online, as do 93% of young adults ages 18-29. 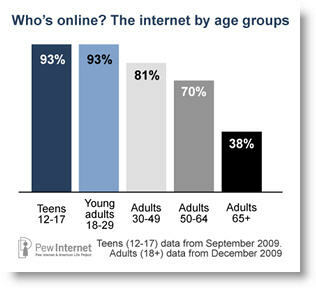 Three-quarters (74%) of all adults ages 18 and older go online. Facebook is currently the most commonly-used online social network among adults. 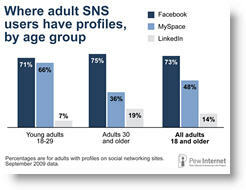 Among adult profile owners 73% have a profile on Facebook, 48% have a profile on MySpace and 14% have a LinkedIn profile. The study also looked at rates of Internet adoption and trends, what gadgets are owned by which age groups of Americans, the penetration of broadband and wireless connectivity, the types of activities engaged in online, and a host of other interesting statistics. I found its findings about the online consumption of news and current events were particularly interesting: Might this suggest that nonprofits who are active on current events and political issues have a stronger reason than ever to respond promptly online to headlines that relate to their missions? Two-thirds of online white teens (66%) say they have gone online to get news or information about current events or politics, while 44% of black teens and 59% of English-speaking Hispanic teens have done the same. 72% of online adults get news online [and] 68% of online adults get news or information online that is specifically about politics. The percentage of adult internet users who get news online has held fairly constant since 2002, [while] getting political news online has increased dramatically since [March 2000, when] just 35% of online adults were getting political news online. You can read the entire report online (or get a PDF download) at PewInternet.org. What findings catch your eye in this new study — and what are the implications, if any, for your nonprofit? I'm trying to find out industry stats on how many people bookmark content when the bookmark this page feature is available. Has anyone got any ideas on where to find that sort of information? Great stat, it’s very useful for who are researching about internet marketing or want internet marketing to find new customers. Thanks for sharing. Nice post, great information. Thanks for sharing.